Lauren joined the Event Floral team in 2015. She then went on to further her education at Southeast Missouri State University and recently graduated with a Bachelor’s Degree in Health Communication with a minor in Public Relations. Her goal is to become a pharmaceutical sales representative and is enjoying her time back with the team at Event Floral until then. Lauren is passionate about painting, photography, and anything else that allows her to express her creative freedom. 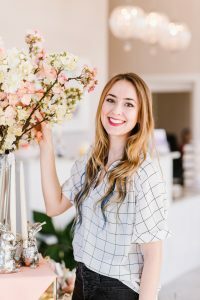 She assists in prepping, installing and producing any event, large or small, and especially loves executing those special, artistic finishing touches on all of our events.